TOKYO (AP) — Global stocks mostly slipped Monday as investors continued to worry about global trade and prospects for economic growth. The price of oil rose amid tensions over Saudi Arabia, a major crude exporter. KEEPING SCORE: France's CAC 40 lost 0.2 percent to 5,087, while Britain's FTSE 100 was down 0.1 percent at 6,989. Germany's DAX bucked the trend, rising 0.3 percent to 11,561. U.S. shares were also set to drift lower, with Dow and S&P 500 futures losing 0.1 percent. ASIA'S DAY: Japan's benchmark Nikkei 225 dipped 1.9 percent to finish at 22,271.30, while Australia's S&P/ASX 200 slipped nearly 1 percent to 5,837.10. South Korea's Kospi edged down 0.8 percent to 2,145.12. 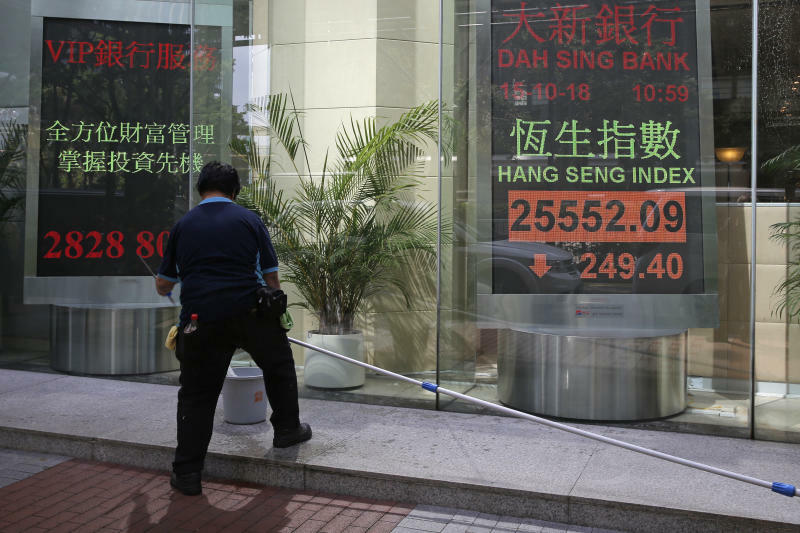 Hong Kong's Hang Seng fell 1.5 percent to 25,411.64, while the Shanghai Composite shed 1.5 percent to 2,568.10. TRADE WORRIES: Investors are growing worried that U.S.-China trade tensions are impairing global economic growth. The International Monetary Fund cut its forecast for global economic growth last week because of trade tensions and rising interest rates. CHINA MEETING: News that Chinese President Xi Jinping and President Donald Trump may meet has sparked hope that tensions in the trade war between the world's two largest economies might ease. But worries about the increased tariffs the two sides have imposed on each other's goods, a move that tends to dampen growth, are contributing to volatility in financial markets. SOFTBANK SLIDE: Shares in SoftBank skidded more than 7 percent. The Japanese technology company's brand is getting slammed because of its link with a major investment fund centered around Saudi government financing called the Vision Fund. The kingdom may be involved in the disappearance and suspected murder of Jamal Khashoggi, a journalist who wrote for the Washington Post. The kingdom has poured $100 billion into the firm's tech investing and has suggested it may put another $45 billion into it. ENERGY: The price of oil was rising, also in reaction to the tensions with Saudi Arabia, a major producer. The U.S. has floated the option of sanctions on Saudi Arabia if it is proven that it was behind the writer's disappearance. U.S. benchmark crude gained 49 cents to $71.83. It added 0.5 percent to $71.34 a barrel in New York on Friday. Brent crude, the international standard, added 69 cents to $81.12. CURRENCIES: The dollar slipped to 111.86 yen from 112.33 yen late Friday. The euro fell to $1.1590 from $1.1602.